Mystery Trackers: Paxton Creek Avenger is rated 3.5 out of 5 by 15. Rated 5 out of 5 by denniann2 from find out why the mystery trackers are being hunted it has a custom level but i didn't see a map. the hint system told you where to go. you have been brought in as a mystery tracker to find the other agents that have gone MIA. they finally find a way to get a hold of you but cannot get to you to help. you have your faithful companion, elf, helping you as always. someone is talking about what the mystery trackers have done to him and that is all you know. he blames them for something. a sequel.....al;sway is. Rated 5 out of 5 by biscuitsmama from IS HE REALLY A GHOST? The legendary Paxton Creek Avenger has returned (or has he) and he has a major grudge against the Mystery Trackers organization. Our Avenger seems to believe that the Mystery Trackers is somehow responsible for all the “sins” in the world. So what does he do? During a performance at the opera he kidnaps the daughter of the MT organization’s chief so now it is time for you to step up to the plate and rescue Ann before it is too late. With your loyal pal, Elf, by your side, you set off on an adventure to rescue Ann and put an end to the Avengers crime spree. The gameplay modes include: Elf, A la mode, Avenger, and Detective. The Detective mode is customizable and you can set your hint and skip times by using the slider bars. However, the times are not specified so you must rely on what you think they might be but I found that the lower end of the bar is almost an immediate reset. The graphics are wonderful and the lip-synced voiceovers are excellent. The game’s tools include an interactive map and your canine companion. Even though I have become tired of animal helpers or other game gimmicks, the MT series just wouldn’t be the same without Elf. Of course since I have a little chihuahua that looks almost identical to Elf, I can’t help but love him. There are various types of interactive HOPs that we are all familiar with by now. There are no surprises here but I love HOPS no matter the type and that is why I am a huge fan of these games. The mini-games are also familiar but very well-crafted and were better than I expected. There are some multi-level puzzles that extend the gameplay and make us think a bit more. I am such a fan of puzzles in a game and they are terrific in Avenger. The CE content includes collectibles, photo pieces and morphing objects. Of course the standards are included as well. All in all Mystery Trackers Paxton Creek Avenger is a great CE value and one I recommend. Mystery Trackers Paxton Creek Avenger is a five-star game that I would rate higher if possible. Every move is not obvious and it requires some thought to figure out what the next step should be. The entire package from the graphics to the sound is excellent. After a couple of games in the series that left me rather bored, I am happy to see an MT game that goes back to the basics of great gameplay with excellent HOPS and mini-games. To say I loved the game is almost an understatement. I know that many of you are extremely underwhelmed with Elf but I can’t imagine a Mystery Trackers game without him. His antics are very cute and I think he is quite dapper in his little doggie tuxedo. Even though I love this game, please try the demo to see if this is a game you will like. Rated 4 out of 5 by bansjee from Interesting HOG deserves merit Played the demo having read other reviews . Didn't see the same negatives that some reviewers commented on. I thought some of the puzzles were challenging and different in their design. Even the HO scenes were of differing types. If I had a negative it was the story line - very Phantom of the Opera but overall a good game. Rated 4 out of 5 by Aliana_4711 from Great game, high quality, good challenge, but too short. My star rating is based on completion of SE and meeting most of own requirements: - Story: You’re a detective. During a performance a mad-man kidnapped the daughter of the head of mystery trackers and blames them, to be responsible for all sins at world. You’re the only one, who can rescue the girl. Hurry. It’s up to you, good luck. - Difficulty can be customized. Sparkles, tutorial, changing icon, plus item indicator, texts, tasks and hint / skip recharge. - Graphics: realistic style, well-done. - Animation: pretty good, especially the people. - Music: is thrilling and appointed. - Voice-overs: good voices, fitting characters, very good synchronized. For my liking, voice and speech of the avenger are exaggerated. - Tools: you have an interactive map – not often necessary. A thermal scope with a tendency to break. And as usual your lovely, trusty and helpful little dog “Elf”. - HO’s: Most known types, a lot of silhouettes (first one had nicely fitting back ground noises), reassembling parts, looking for specific objects, description, pairs, riddles, morphing objects and more. 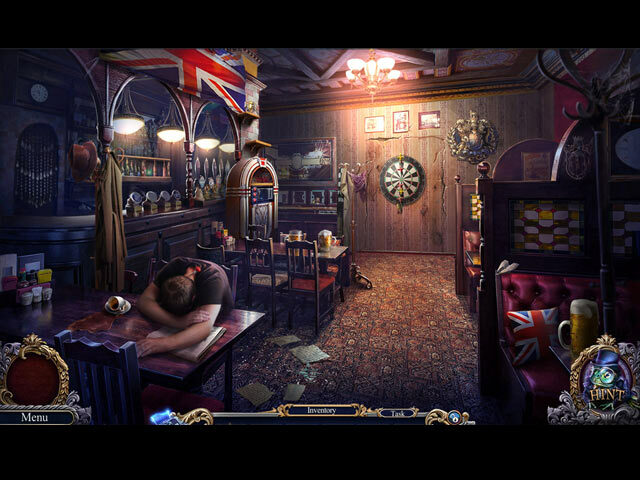 - Mini games: Some could be played either hard or casual. Nothing new, but well-crafted and nicely adapted. Included some mega puzzles. The mini-games were funny, but not too difficulty. 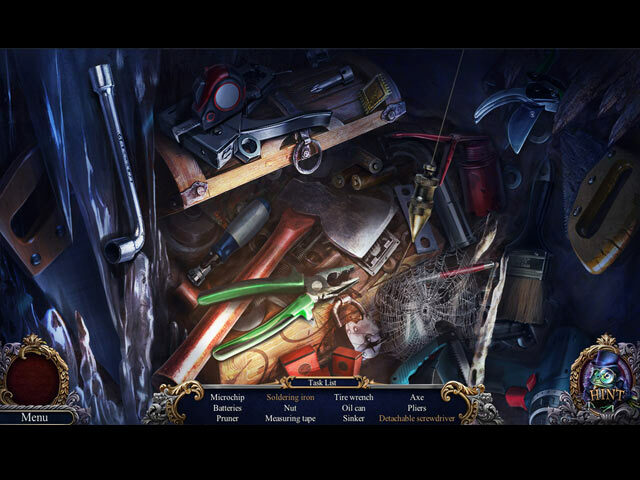 - Adventure part: The needed items are spread about several locations. Usually you have about 5 locations to investigate, so an interactive map is just nice to have. Even w/o helping texts, the tasks were logical and doable. - Specials: nice gimmicks along the game, eg. hiding people at the theater. Dislikes: - Length: Sadly, I needed only about 3 hours for completing. That’s too short. - Sometimes it was not that realistic: Interesting, how long a fire can burn, w/o spreading? It does not matter, how long you need to solve the tasks, every time you’re opening the next secret passage the avenger is just one step in front. A spotlight lamp, fitting in a flashlight? Really guys? - Change of cursor is unobtrusive, you have to be very attentive. All in all, it is really a great game –except length. It is crystal-clear, that highest quality plus good length are an issue due to cost-benefit ratio. But 3 hours were too short. Thus, I’m rating with 4 stars. I recommend, try it and have fun. Rated 4 out of 5 by pennmom36 from The Son's And Daughters Of The Mystery Trackers Must Pay For Their Parents Sins A Ghostly entity who has been dubbed The Paxton Creek Avenger, is seeking revenge against the Mystery Trackers Organization. This phantom of the opera believes the MT agents are responsible for all of the world's sins, and has kidnapped the Commander's daughter, Ann Freeman. The Avenger is now taunting the Mystery Tracker's agents with a boastful video of his intentions to make their son's and daughter's pay for their sins. The ghost of the Opera singer has arisen from the dead to seek revenge, a paranormal case perfectly suited for an organization whose motto is to "seek and serve" even when the case is far from normal! Mystery Trackers just wouldn't be the same without our little four legged agent, Elf would it? Of course not, and this pint sized detective is always ready, willing and absolutely able to take on tough cases like this at a barks notice, bravely going where no two legged agent could possibly fit. After all, someone has to retrieve the evidence that somehow manages to make it to the top of a tree, nestled deep inside a hole that's pitch black! Naturally, you are equipped with the latest gadget the department has invented, a Thermal Scope that locates heat sources and helps you track down the bad guy, and everything else that has a heat signature, right? . (Hey, I thought he was a ghost, do they produce a heat source?) The Thermal Scope will allow you to pinpoint the PCA's (Paxton Creek Avenger) point of origin as well as the point of departure and you'll have to play a Mini Game that becomes increasingly more difficult each time you use it. The Collector's Edition has 26 Morphing Objects and Morphing Collectible Orchestra members, hidden Photo pieces, and 21 Achievements to earn. which is the better version for me because I love Morphing Objects. 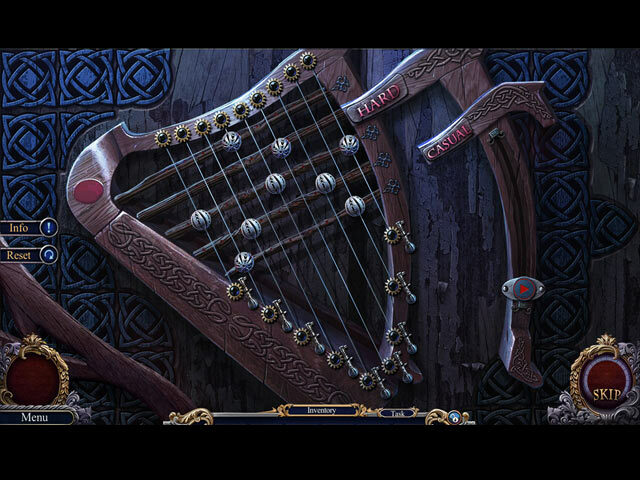 The Hidden Object Scenes are varied with Silhouetted Shape finds, Silhouetted hidden Musical Notes, finding 18 hidden notes within a painting and of course the typical interactive list finds that are the norm for most MT games. The Mini Games have become way too easy in the MT series, some of them offer the puzzle in Casual or Hard, but even on Hard, the game was super simple. The following are brief descriptions of the games you'll encounter during the demo: 1) Rotate disks to restore the image. 2) Rotate the circles so that the notes match the code. 3) Thermal Scope games, connect the symbols so they don't intersect or the line doesn't directly connect an identical symbol. 4) Move circles to the correct spot on the strings, Red means wrong placement, yellow means close and green is correct. 5) Press the piano keys in the right order. 6) Select bricks in the correct order. 7) arrange music tokens so they match the center token using arrows to rotate and buttons to swap. 8) Rotate the safe handle left and right to find the correct combination. 9) A Super Puzzle where you use clues to solve and progress through each mini game until complete. The Collector's Edition has 8 Wallpapers, 8 Concept Art pictures, 21 Achievements, an Archive, 6 Music Soundtracks, 26 Morphing Objects, Collectible morphing Orchestra members, hidden Photo pieces, a built in Strategy Guide and a Bonus Chapter, enjoy! Rated 3 out of 5 by LTurg from Too Short The game was just okay but it was toooooo short. Rated 3 out of 5 by txmimi from Glad it was on sale I've played almost all of the Mystery Trackers games, and I don't think this one measured up to the earlier ones. It was OK. . . that's the best thing I can say about it. I'm glad it was on sale, since it was worth the $3.50 I paid for it.